These lamps are stunning!! 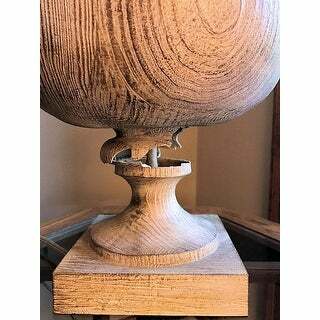 I especially love the wood tones in the base. They are large which is exactly what I was looking for since my family room is very large. They arrived in perfect condition, and I couldn't be happier with the quality of these lamps!! 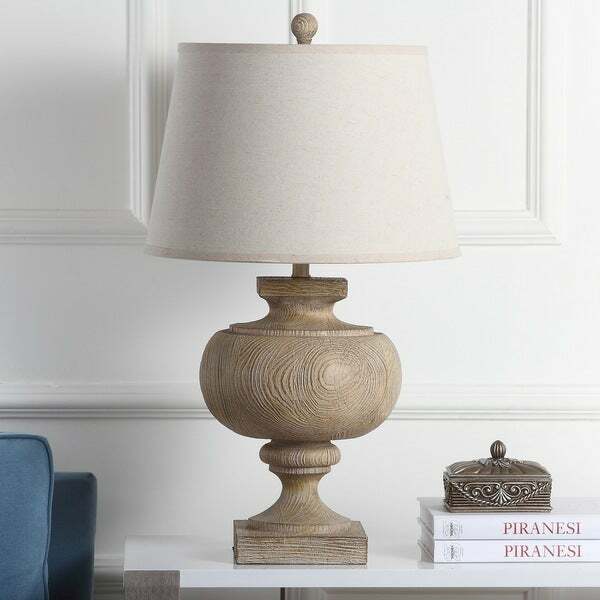 A sophisticated update to traditional lighting, this timeless 31-inch wood table lamp refreshes any living room. Designed with a neutral natural wood finish and round oatmeal shade that accentuate its curves, designers use it in pairs to frame a sofa. I love these lamps! I ordered a pair for our master bedroom and the first set came broken. I submitted a claim and a new set was mailed almost immediately. 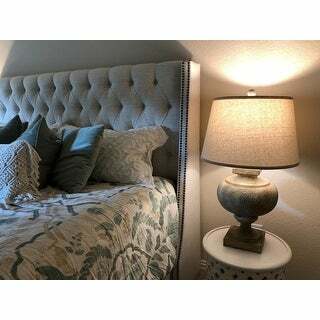 These are definitely a larger scale lamp that looks great in our room with taller ceilings. I love the scale and wood finish. The linen shades give off a soft glow! 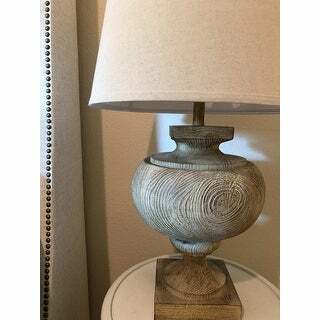 This is a distressed but elegant lamp. Very French country style. However, the photo doesn't show the size of it. It's HUGE. 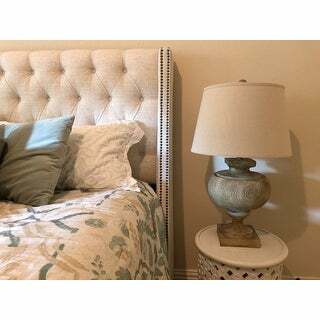 I have a not so small night stand and this lamp overwhelms the night stand. This is better suited for the living room by the sofa than the bedroom. And your living room should be above average size. Large and substantial looking side lamp! I got two for a guest bedroom. 4 stars because the imitation wood base is just slightly unappealing - you can see where the stain and glue settled in a few areas, but only if you look closely. It is made of resin or some type of plastic-y material, so it's completely hollow and lighter weight than you'd expect but still pretty well constructed considering. The quality of this lamp is exceptionally. Looks way more expensive than it is. The shade is high quality and it was exceptionally easy to assemble once it arrived! I ordered 2 of these because I wanted matching lamps for beside my bed. The quality is very nice. They are larger and more substantial than I expected. Looks like a lamp I could have gotten from Restoration Hardware. I am very pleased with my purchase! I'm not sure how to rate this purchase because I absolutely loved the lamp but hated how it arrived. It arrived severely damaged but, it was not damaged in transit. It was packaged that way. I loved the lamp so much, I'm pretty sure I would have tried to glue it together had the broken piece been in the box. At the time, I wasn't able to re-order as I was told the lamp was out of stock. More must have arrived since then because I tried ordering it again and another is on its way. Hopefully, this one will arrive in perfect condition. 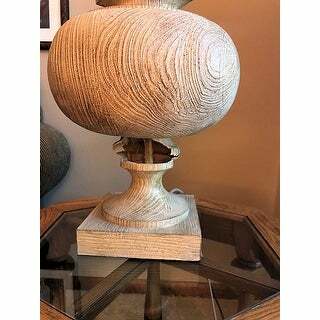 A great statement piece without being too formal or ornate. Love it. The size is perfect for what I wanted it for. My first one arrived broken but a replacement was sent immediately. "Does this lamp have a three-way switch? Description does not say "
This has a standard rotary On/Off switch. "I'm curious about the color of this lamp. The title says it's light grey, the description says it's brown/tan and the customer photo looks like it is dark grey on top and brown on the bottom. Would someone please let me know which of these colors is accurate?" I love the shape and that it’s real wood.